It is an exciting time to be a nurse as you’re on the frontlines of health care, and national demand for professional nurses is outpacing the number of practicing nurses. As a nursing major at Truman, you learn how to provide safe, effective nursing care to patients of all ages in a variety of health-care settings. At Truman, you will pursue a Bachelor of Science in nursing (BSN) through our four-year program. Or if you already have a Bachelor’s degree (or are close to earning one), we offer a program that allows you to earn an Accelerated Bachelor of Science in nursing (ABSN) in 18 months. The baccalaureate degree program in nursing at Truman State University is accredited by the Commission on Collegiate Nursing Education (http://www.ccneaccreditation.org). Truman’s nursing program is approved by the Missouri State Board of Nursing (MSBN). Our Nursing Simulation Center (NSC) has the look and feel of a hospital complete with high-tech medical equipment so you can become familiar with working with patients in a safe environment. Practice your critical-thinking and decision-making skills on life-sized anatomical models called “manikins” that have electronic heart, lung, and bowel sounds. As you advance through the curriculum, you gain field experience with real patients in various clinical settings. You can enhance your educational experience through research and learning service, as well as study abroad experiences in the Philippines, South Africa, Costa Rica, and other locations. At Truman, you will find a lively and engaged community of learners. Your professors have a passion for the field and are eager to share their knowledge and nursing experiences. You are treated like a professional—and if you are struggling, you can count on help from your professors. And with our small classes, you will quickly develop a sense of companionship with other nursing students. You will laugh together, cry together and spend late nights studying hard together. And you will make some of the best memories of your lives together. Truman is also home to the Rho Omega Chapter of the Sigma Theta Tau International Honor Society of Nursing, one of the world’s largest nursing organizations. When you graduate, you will be well-prepared to function as a generalist in beginning positions in all areas of nursing practice including maternal, child, mental, adult, and community health nursing. Over the past five years, an impressive employment rate for our nursing graduates has averaged around 96 percent. Our nursing program also provides a solid foundation for pursuing graduate study. Graduates who meet the requirements of section 355.066 of the State of Missouri Nursing Practice Act are eligible to apply for the registered nurse licensing examination. 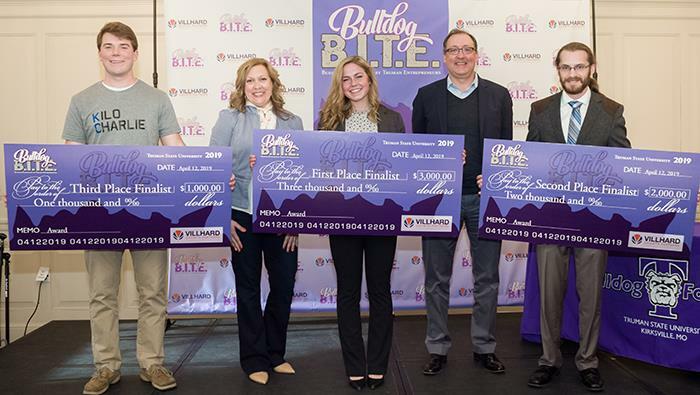 Kailey Micek, a senior business administration marketing major, won the 2019 Bulldog B.I.T.E. elevator pitch competition. These final productions represent a synthesis of numerous concepts explored in the course of the semester. Students explored composition and picturization techniques, scene analysis, how to develop a directorial approach and methods on how to work with actors.